What if you could wake up each morning and decide where you want to work that day? Your selections include New York, Denver, Barcelona, Paris, Montreal or Amsterdam. 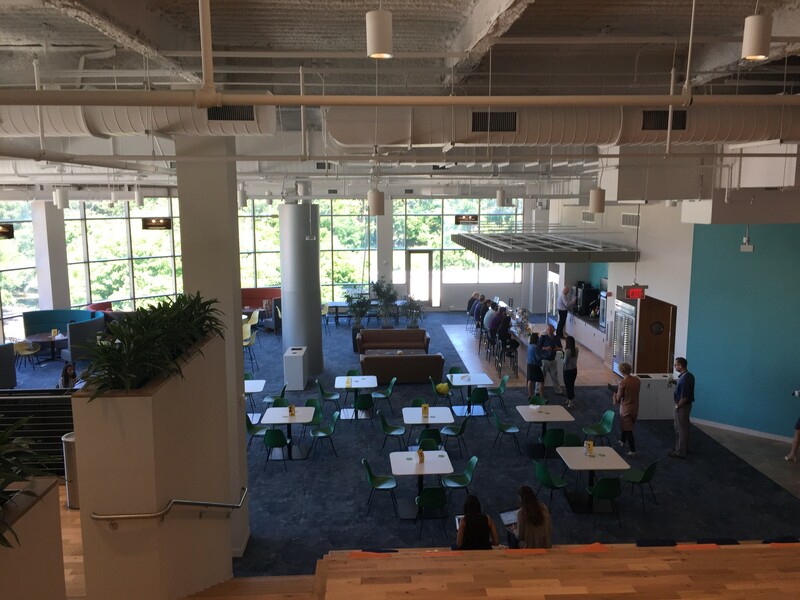 Well, employees of Danone North America are able to make that choice every day—their new 80,000-square-foot headquarters at The Source at White Plains (1 Maple Ave.) is divided into six international “neighborhoods” based on Danone’s worldwide office locations. 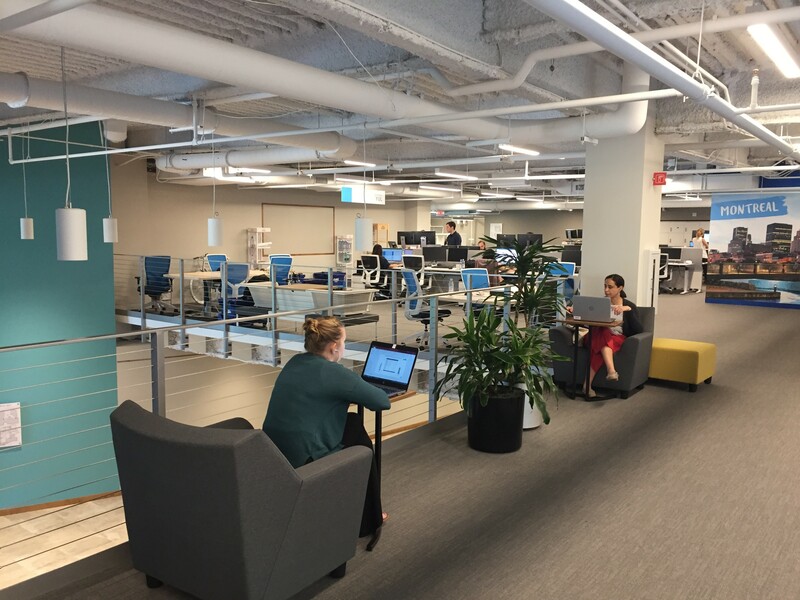 Not only can they choose their destination, but they can also choose their work stations—only 25% of its employees have assigned desks or offices. Each “neighborhood” offers an open floor plan with desks that convert from sitting to standing, desktop and laptop computers, and “soft phones” integrated with the computers to indicate when calls come in. There are 59 conference rooms scattered through the “neighborhoods,” as well as small offices that are available on an “as needed” basis. From left; Michael Neuwirth, Senior Director, External Communications and Kim Cassano,, HR Organization Development Project Associate. Kim Cassano, HR Organization Development Project Associate, played a major role in the company’s move from its former location at 100 Hillside Avenue, across from the Greenburgh Town Hall. “We had been there for about 12 years—we used to refer to that location as ‘the beast,’” she quipped. The planning process began about two years ago, and one of the company’s main objectives in moving was to have everything on one floor. They also wanted plenty of parking for the company’s more than 350 headquarters’ employees, as well as a central location that was easy to access. Relocating the nation’s 15th largest food and beverage firm was no easy task. It required the expertise of Jones Lang LaSalle commercial real estate brokers, with offices in White Plains, Stamford, CT and Manhattan, as well as CPG Architects and Pavarini Construction, both located in Stamford, CT. Herman Miller, noted modern furniture retailer, provided the office fixtures. 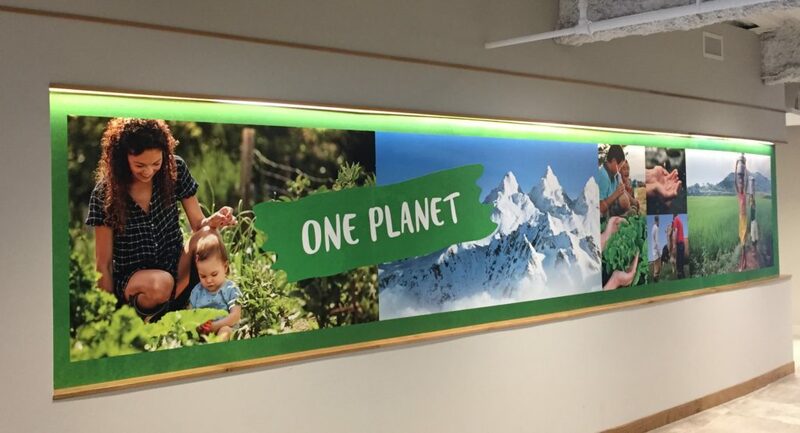 The main hallway leading from the lobby is named “Inspiration Drive” and features a huge mural with the company’s tagline, “One Planet, One Health.” Emanating from there are crossroads to other “neighborhoods,” along with various nooks and crannies offering tables and chairs for impromptu meetings or even bean bag chairs. Another big difference from the traditional office is the lack of printers and trash cans at every desk. “We have one printer for each neighborhood, so it cuts down on the paper usage,” said Neuwirth. “As for the trash cans, we found if you have them you just make more garbage.” Instead, there are centralized waste and recycling centers. Clean desks are also encouraged. Lockers are available for coats, purses and other belongings, and employees keep images of loved ones or pets on their screensavers in place of desk photos. It’s also rare to find anyone dressed in suits or other typical business attire, and it’s unlikely you’ll hear the clacking of high heels going down “Inspiration Drive.” The dress code at Danone is very casual. “We want people to feel comfortable coming to work,” added Cassano. “One of our employees recently had dental work done and wasn’t feeling well, so this was the perfect place for a ‘time out,’” explained Cassano. The rooms are booked in advance for half-hour sessions. 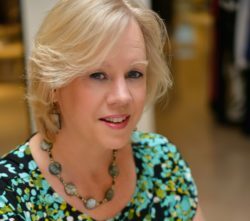 Kate Lister, president of Global Workplace Analytics in California, believes open office plans will continue to be a popular trend in the future. Global Workplace Analytics helps organizations and communities understand how new ways of working can impact people, the planet, and profits. Another continuing trend that Global Workplace Analytics is following is “activity-based work,” which is built around individual and team tasks. “Throughout the day, people are doing different kinds of work, so it stands to reason they probably shouldn’t be sitting in just one place all day,” said Lister. • Learn: Acquiring or developing through combined learning activities. To help employees recognize the various areas, Cassano has developed “activity mode” coasters that are placed on tables and desks throughout the facility. Contributing to the whole “open feeling” throughout the building are high ceilings with soft lighting. The ceilings are also coated to reduce noise and control the temperature. 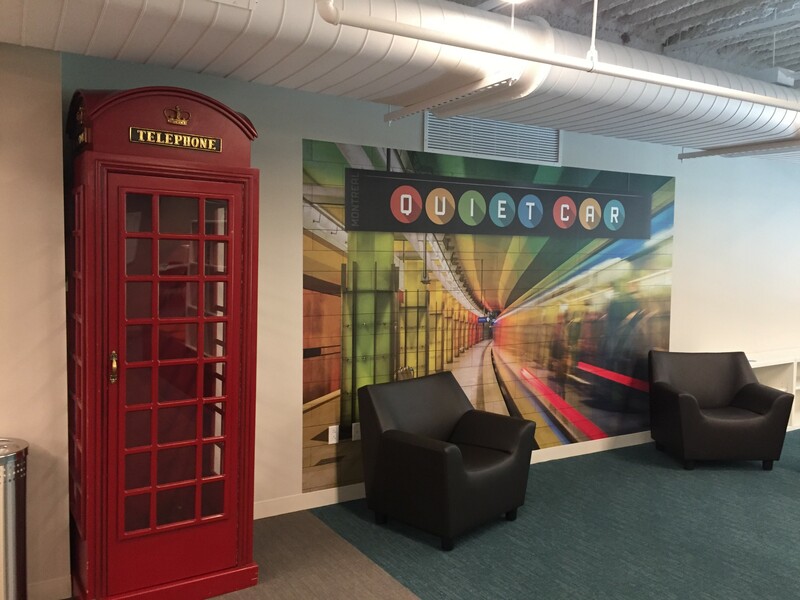 In addition, there’s a large lounge area known as the “Quiet Car” that serves as a conversation-free area for quiet reflections. Many of Danone’s White Plains employees commute to work by car, while others rely on buses or trains. The company provides daily shuttle service to and from the White Plains Metro-North station. 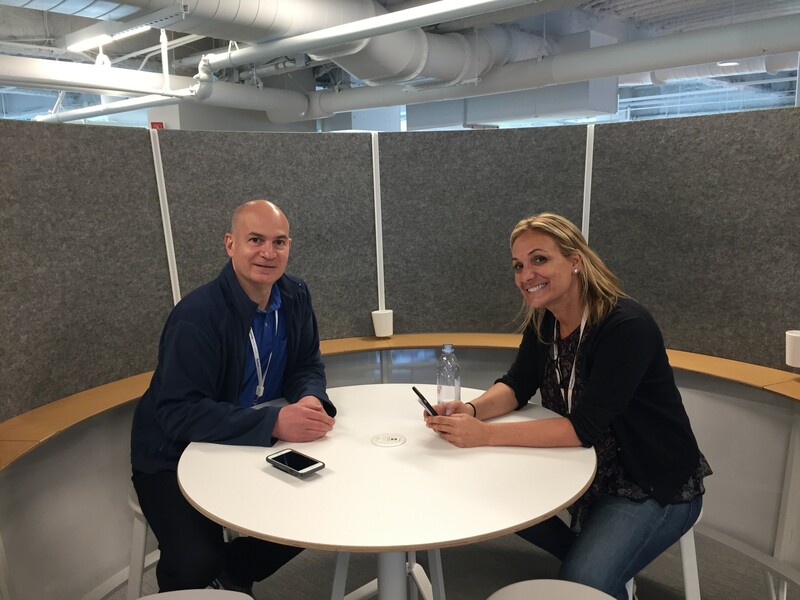 Today, the Danone North America team is comprised of some 6,000 people with offices the U.S. and Canada and more than 15 manufacturing facilities across North America. The company is also committed to community outreach and designates a month when employee teams go out into the local communities to volunteer their services to various causes or non-profit organizations. In-house, the company’s Inclusion Council helps to foster a diverse culture and has initiated a variety of employee resource groups. In addition, Danone offers ongoing professional development opportunities for employees. Danone North America is a subsidiary of Danone, a French multinational food products corporation based in Paris and founded in Barcelona, Spain. Danone North America’s brands include: Dannon®, Silk®, So Delicious®, Horizon®, Vega®, Wallaby®, Earthbound Farm®, International Delight®, Activia®, DanActive®, Danimals® Danino®, Light & Fit® and Oikos®. So, what does the future of office work look like? “There are some firms now where even the CEO doesn’t have an assigned desk,” said Lister. She also described a firm in the Netherlands that is so technologically-advanced that it coordinates with your navigation system to direct you to a parking spot, automatically adjusts the temperature in your work space, and its kitchen even remembers the type of coffee you like. “I think that’s just a bit ‘Big Brother’ for us here in the U.S. now, but who knows, it may be coming soon,” Lister said. Editor’s Note: The Westchester County IDA granted approximately $1.273 million in incentives for the project that involved Danone’s headquarters relocation from Greenburgh to Downtown White Plains that the company estimated would cost more than $30 million to complete.